Make the brine: Place all brine ingredients in a large saucepan and add 16 cups water. Bring to a boil over high heat; boil until salt is dissolved, about 1 minute. Remove from heat and let cool completely. Cover and transfer to refrigerator until chilled, up to 3 days. Make the chicken: Place chicken pieces in chilled brine. Cover and transfer to refrigerator for 12 hours. Remove chicken from brine and rinse under cold running water; remove any herbs or spices sticking to skin. Pat dry with paper towels and let stand at room temperature until chicken comes to room temperature, about 1 1/2 hours. Fill a large, deep pot 2 inches high with oil. Place over medium-high heat; heat until oil reaches 320 degrees on a deep-fry thermometer. Set a cooling rack over a baking sheet; line a second baking sheet with parchment paper. Set aside. 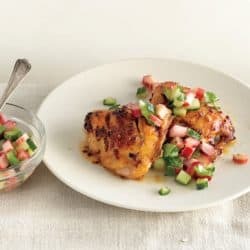 In a large bowl, whisk together flour, garlic powder, onion powder, paprika, cayenne pepper, 2 teaspoons coarse salt, and 1/2 teaspoon black pepper. Divide evenly between two large bowls. Add buttermilk to a third large bowl and season with salt and pepper. Coat chicken pieces first in flour mixture, then in buttermilk, and finally in second bowl of flour mixture; transfer to parchment-lined baking sheet. Carefully add legs and thighs to hot oil; cook, turning and monitoring oil temperature, until deep golden brown, 11 to 12 minutes. Transfer chicken to prepared rack skin-side up; season with sea salt. Increase oil temperature to 340 degrees. Add wings and breast pieces to hot oil; cook, turning and monitoring oil temperature, until deep golden brown, 6 minutes for the wings, 7 minutes for the breast pieces. Transfer to prepared rack and sprinkle with sea salt. Remove oil from heat and immediately add rosemary and thyme sprigs; cook until crisp, 30 seconds to 1 minute. 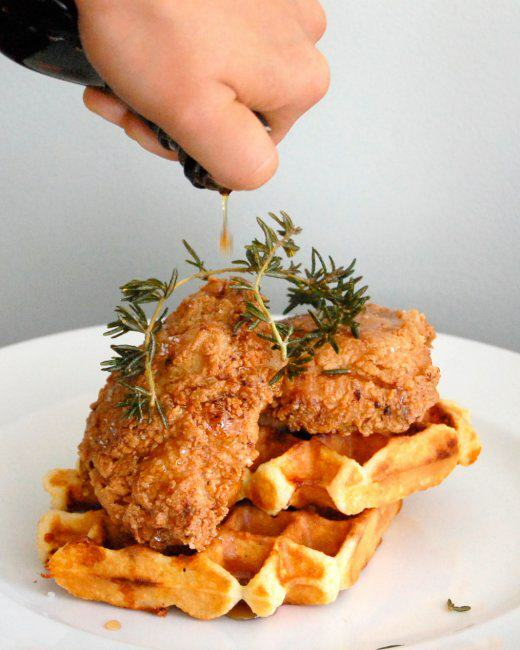 Serve chicken with Waffles and maple syrup. 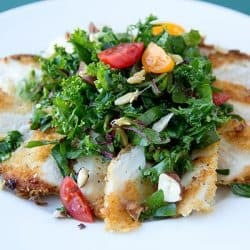 Garnish with fried herbs.